Packing up from Manyatta Backpackers and hopping into the 14-person Mutatu with 15 people and 15 large backpacks made it feel a bit crammed. However, everyone was in and we were off. About 5 minutes into the trip we realized that an iPhone was left behind, although this person was quick to let it go for 6 weeks I jumped on the going back wagon since I thought I’d left my passport back at the hostel! By the time we made our decision it was too late, we had two officers baring SMGs circling around the car. After a quick examination they realized that we had an “excess passenger” (Despite the 20-person filled Mutatu’s driving everywhere). Luckily, after some explaining we were able to go without paying a bribe, but we wouldn’t get so lucky in future circumstances. We reached the highway and it was shoulder-to-shoulder, knee-to-chair, head-to-ceiling cruising. 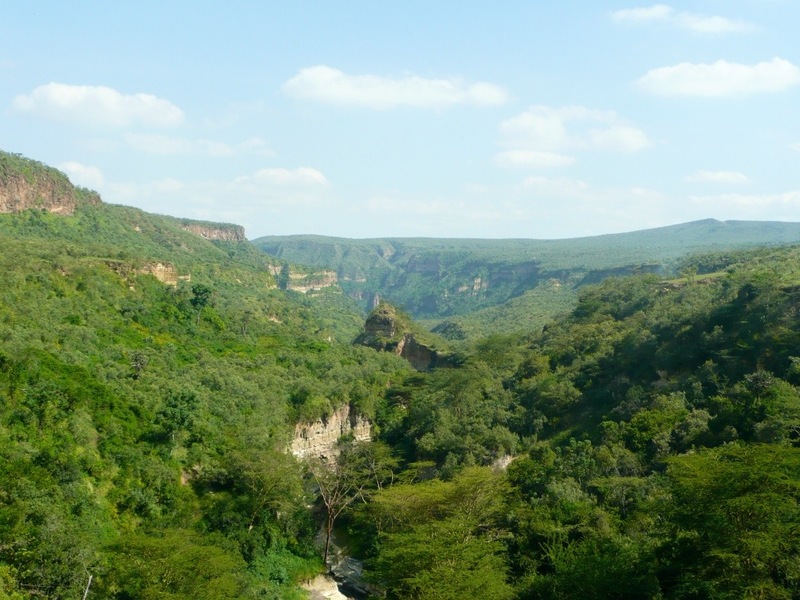 Despite the uncomfortable nature of the ride the first time you round the bend and the amazing Rift Valley comes into view you are awestruck by just the size of the low plains that’s considered the birthplace of civilization. Surrounding this low plain is mountains and plateaus giving it an amazing appeal. 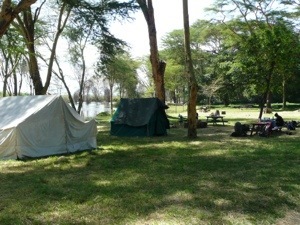 After 3 hours we reached Lake Naivasha, and our home at Fisherman’s Camp. We arrived midday and organized for one 10-person tent, and one 5-person tent, but obviously we used the latter for gear and the former for ourselves. 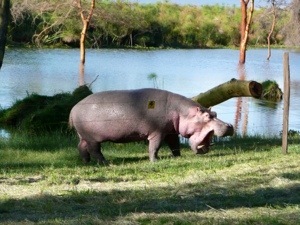 I rented a bike and decided to take it for a cruise around town, after picking up a few groceries I came back to the camp to find a massive hippo standing about 30ft from where I was standing, and luckily an electric barbed-wire fence about 25ft from me. The rest of the night consisted of Tuskers, bonfires, and laughs. Waking up in the morning and having a long stretch we were ready to take on Hell’s Gate National Park. To tackle this park we had the help of Joseph, a man who paints his dreams every morning, lead climbs 5.12+ routes, is a professional body painter, and is generally an immensely interesting man. We took some time biking through the plains surrounded by huge rock faces and immense forest filled with zebra, warthogs, giraffes, impala’s, a potential leopard, and buffalo. Although the path is loose sand making it difficult to venture it was a beautiful ride that lead to a quiet lunch spot to enjoy peanut butter & banana and tomato & avocado sandwiches. We took a good hour to eat and relax before we took off into a place simply known as “the gorge”, a stunning walk down the middle of a deep natural gorge, that breaks into open expanses, contains boiling waterfalls heated from the volcanic layer underneath, and a history of growth and decay painted on every inch of rock. Walking through the gorge is a vast understatement since it involves climbing, falling, sliding, ducking, jumping and some running. All of this eventually leads to a tall rock face, known universally as “Pride Rock”, and yes, this is the pride rock the Lion King is based off of. The top point unlike the movie actually looks over a densely forested expanse of land and deep into the gorge. We now had to bike back to our camp so I hopped on my bike, took two pedals and realized my front tire was completely flat, and during our hike someone had stolen our bike pump attached to the back of the bike. So the long walk began back to the gate. Joseph biked back to the gate and drove a van to rescue those stranded without air it tires. Since I’d fallen behind I was in a race with myself to get to the gate as fast as possible and once I was there I decided to keep the momentum going. I was flying on 3 and 8 down a gravel path when I realized I was coming to a T-junction littered with Mutatu’s. I brake and tried to make the left turn but inevitably the tires slide out from under me and I was thrown across the pavement bracing myself with the palms of my hands…a bad idea. In the end I got back and cleaned up and settled down to penne pasta and a warm fire. We’d been to hell and back, and everything was gravy.